In 2.2 we learnt exponents and several laws. This method of representation is called ‘exponential form’. The above method of representation is called ‘logarithmic form’. Convention: If base is not given, then the base is assumed to be 10 (log20 implies log1020). 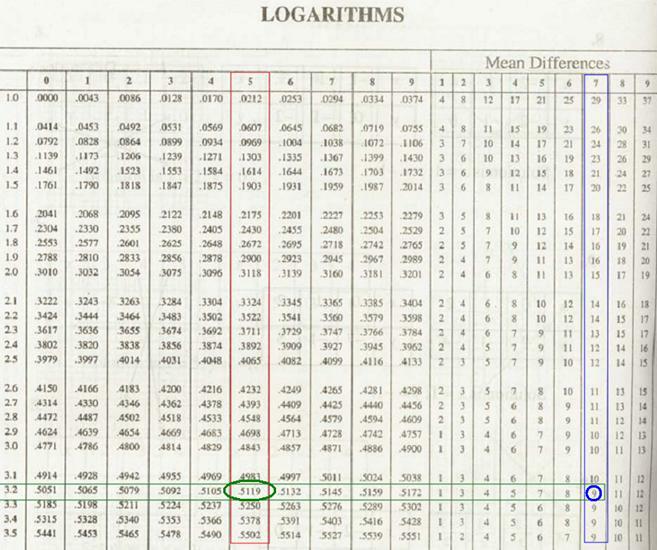 We have seen that log1=0 and log10=1. 2.3 Problem 2: Given log x = m+n and log y = m-n. Express log (10x/y2) in terms of m and n.
Since base is not given, it is assumed to be 10. Thus log x for any value of x (1 x 10) has to be in between 0 and 1.
log 1000 = log(103) = 3log10=3*1=3 and so on…. log value of a number has two parts: an integer part and decimal part. The integral part of the logarithm is called ‘characteristic’ and the decimal part of the logarithm is called ‘mantissa’. In case of log 2 = 0.3010, 0 is characteristic and .3010 is mantissa. We use a table called ‘logarithmic table’ to find the values of numbers to the base 10. As we observe from adjacent figure, the table has three parts. 1. First part is the left most column (Blue box) which contains numbers from 1.0 to 1.5(The adjacent figure only has a part of the table from 1.0 to 1.5 but the full table has values from 1.0 to 9.9). Against each number in the first column there are 10 columns in 2nd part, having decimal values corresponding to digits from 0 to 9. Against each number in the first column there are 9 columns in 3rd part, having decimal values corresponding to digits from 1 to 9. Thus if we know the logarithmic value of a number having one integer digit, then by using product and power laws of logarithm we can find the values of any given number which is multiple of the given number. How to use the log table? 1)First convert the given number into a decimal such that there is only one digit in the integer part and there are not more than three digits in the decimal part. 2)Split the given four digit number into 3 parts (first part with two digits, then two parts of one digit each).In this example 32.57 is split into three parts (3.2, 5 and 7). 4)In this row find the value under the number which corresponds to the second part(in this example under 5). If log3257 = 3.5128, then 3257 is called ‘antilogarithm’ of 3.5128 and we write antilog3.5128 = 3257 or log-1 (3.5128) = 3257. Like logarithmic tables we also have antilog tables, a section of which is given below. The usage of antilog table is similar to log table. By substituting values for p, q and r.
Why use Logarithmic and antilogarithmic tables?